More than 86% of Americans decorate their homes as part of their holiday celebrations. Keep your holidays happy and bright. Review these electrical safety tips to avoid hazards that could occur. After you take your holiday decorations down from the attic the first thing you should do as you are taking the decorations out of the box is inspect them all. Do not use your electrical decorations before inspecting them. When you are inspecting your holiday decorations you are looking for things like damaged sockets, loose wires and loose connections. Loose wires and loose connections could cause shock or fire. If your incandescent lights aren’t looking the greatest anymore consider replacing them with LED lights. LED lights use less energy and run cooler than incandescent lights. If you do choose to use your incandescent lights from last year be sure to never connect more than three strings of incandescent lights. Connecting more than three strings of lights can trip a circuit breaker, or even worse cause a fire. 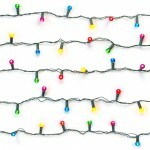 Keep strings of lights away from children, these lights can pose as a strangulation hazard. Always check your decorations for a label from an independent testing laboratory. If they don’t have a testing label they haven’t been tested for safety and could be hazardous. Okay, your artificial tree is up, lights and ornaments are on it, but does your tree have metallic leaves or branch coverings on it? Lighted ornaments and strings of lights placed on a tree with metallic leaves or branch coverings can be a serious fire hazard. When plugging in your lights don’t overload electrical outlets. This is one of the most common causes of holiday fires. Make sure outdoor lights are plugged into GFCI protected outlets. Most of us use extension cords when decorating for the holidays. Do you know if your extension cords are properly rated for their intended use? According to the U.S. Consumer Product Safety Commission, faulty extension cords cause 3,300 residential fires each year, resulting in 50 deaths and 270 injuries. Protect electrical cords from damage. Cords should never be pinched by furniture. Never nail or staple cords. Cover any unused electrical outlets or extensions cords with plastic caps to prevent children from getting hurt. Don’t forget to be safe with not only your indoor decorations but also your outdoor decorations. Don’t use decorations outside that are not marked for outdoor use. Keep snow and standing water away from extension cords. Last but not least don’t forget to turn off decorations when going to sleep and enjoy your holidays! Need an electrician in the Raleigh area? Give us a call when you need a professional electrician in Raleigh, NC. Our electricians have the tools and the talents necessary to make minor or major electrical repairs, and can typically have your home back up and running on our first visit.